It's not an illusion, the Rams' offense is as bad as it looks. In fact, with just two games remaining in the 2011 season, the Rams' lack of production has reached historic proportions. With a league-low 166 points scored, the Rams are on pace to score less than 200 points for only the second time since World II. 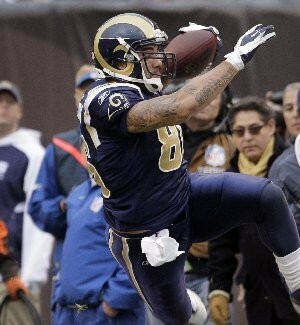 If the Rams stay on their average of 11.9 points per game, they will complete the 2011 season with 190 points scored. And given the caliber of the defensive competition in their final two games, the Rams might be lucky to score at all. Entering their Monday night game at Candlestick Park, Pittsburgh was ranked No. 1 in the league in total defense and No. 2 in scoring defense. The Steelers' foe, San Francisco, was No. 4 in total defense and No. 1 in scoring defense. The Rams travel to Pittsburgh for a Christmas Eve game at Heinz Field. Then on Jan. 1, they ring in the New Year by playing host to San Francisco in the season finale at the Edward Jones Dome. The Steelers are in a knock-down, drag-out fight with Baltimore for the AFC North title. The 49ers, who beat the Rams 26-0 on Dec. 4, still could be in the running for a first-round playoffs bye when they face the Rams. So neither team might be resting any regulars when they play St. Louis. But in those days, the Rams played only 10 or 11 games a season, not 16. Even the 1982 Rams during that strike-shortened nine-game season managed to score exactly 200 points. So from the '44 Rams, who scored 188 points in a 4-6 campaign, one must go all the way forward in time to the '09 club —which scored 175 points — to find another Rams team that scored fewer than 200 in a season. In '09, Spagnuolo stepped into the considerable mess left by predecessor Scott Linehan, one replete with bad draft picks and failed free agents. The 2010 offense under rookie quarterback Sam Bradford was much improved, scoring 114 more points than the '09 squad, marking the second-best improvement in points scored in the NFL by a team from '09 to 2010. But despite the signing of offensive coordinator Josh McDaniels, the drafting of two wide receivers and a tight end in Rounds 2-4, the trade for Brandon Lloyd and the signing of offensive lineman Harvey Dahl in free agency, the Rams have regressed noticeably in this injury-plagued 2011 season. As Dahl said after the Rams' 20-13 loss Sunday to Cincinnati, "We just can't get it all connected on offense." The Rams rank last in the league in third-down conversion rate (26.9 percent) and are 30th in red-zone offense, scoring touchdowns on just 35.7 percent of their possessions inside the opponent's 20-yard line. "It's hard to move the ball when you're not converting on third down," Spagnuolo said following the loss to Cincinnati. "We haven't been able to generate those explosive plays, and that's kind of been the story a lot. "For whatever reason (defenses) are taking away certain weapons that they defend a certain way. We've got to try to manufacture some points working our way down the field. It's hard to be perfect for however number of plays, but one thing we've got to do is convert on third down." With a tattered offensive and no true fullback on the roster, the Rams had trouble gaining inches — much less yards — on third down against the Bengals. In going 0-for-eight on third-down conversions through three quarters, the Rams never faced any situation longer than third-and-7. • Steven Jackson was stopped for 1- and 2-yard losses on runs. • Kellen Clemens was sacked twice. • Clemens threw incomplete once and scrambled once for one yard (on third-and-2). • The only other plays to gain positive yardage besides Clemens' scramble were a 1-yard completion to Lloyd on third-and-4 and a 5-yard completion to Danario Alexander on third-and-6. A facemask penalty against the Bengals' defense did give the Rams a first down on third-and-1 in the second quarter, but because it came on a penalty it wasn't counted in the conversion stats. On the actual play, Lloyd lined up in the backfield took a pitch from Clemens, and was nailed for a 3-yard loss. So the red zone remains the dead zone for the Rams, and the act of actually crossing the goal line remains a rarity. The Rams have scored only 15 TDs this season, and if that number doesn't change against Pittsburgh and San Francisco, it will be the second-lowest total in franchise history — trailing only the 10 TDs scored by the Cleveland Rams in 1937. And if the Rams don't score at least 34 points over their final two games, they will become just the 15th team in the NFL since the advent of the 16-game schedule in 1978 to score fewer than 200 points. Those hardly are "milestones" a team wants to reach. SAN FRANCISCO • By now the details are no longer very important. Let's just say that Sunday in Candlestick Park for the Rams was just like any other NFL Sunday — another bad loss in another lost season that makes every game day feel like a regurgitated Groundhog's Day nightmare for this really bad football team. By the end of this 26-0 loss to the San Francisco 49ers, the 2-10 Rams were doing what they always do, marching glumly off the field while another team celebrated. The Niners were prancing around Candlestick doing all sorts of silly dances and waving and blowing kisses to their giddy fans after clinching the NFC West title. And while the Niners partied, the Rams were forced to ponder their increasingly sorry state, which appears to be getting more hopeless as the weeks go by. This may have been the worst loss of all, because the Rams had absolutely no chance of ever winning this game. Seriously. No chance at all. Not when your injury-plagued, patchwork offense is physically incapable of scoring. I'm not trying to be flippant, either. The Rams' offense is now averaging less than a touchdown per game, which should not be possible in professional football. But on Sunday, the Rams' offense had one offensive possession (out of 12) all game that was over five plays and never came within 37 yards of the end zone all day long. Oops, I said I wouldn't bore you with details. At this point in this franchise's unsteady history, the only thing that any of you really want to know is when and how this bad football will ever end. There's only one man who can provide those answers and his name is Stan Kroenke, the majority owner, who is not exactly reclusive but does not particularly regard public attention as essential as air or water. While it's popular to characterize Kroenke as some indifferent absentee owner, nothing could be further from the truth. As I've told you before, he's almost always around on game days but usually slips out some back door in the locker room before reporters can get close. But Sunday, Kroenke decided not to make a hasty exit. Instead, he lingered in the cramped visitors' locker room, slowly navigating his way over and around half-filled equipment bags, discarded balls of tape, helmets and shoulder pads. The man who hasn't said very much publicly about the state of his woeful football team quietly moved from locker stall to locker stall, shaking hands and whispering in the ears of his dispirited employees. With some players, it was nothing more than a firm handshake and a quick word. With others, Kroenke lingered a bit longer, placing a hand on a shoulder, maybe holding on to a forearm, too. But each time, he looked them all square in their eyes and spoke to nearly every player in the room. "I just wanted them to know that I appreciated their efforts," Kroenke would say a few minutes later as he stood in a narrow hallway just outside the locker room. "I know they don't count that in the NFL, but I wanted to make sure the players knew I do appreciate their effort." And that was pretty much it. He chatted politely for a few more minutes before making a retreat into the parking lot where a car was waiting to whisk him off to a waiting jet at the nearby airport. Is he mad or frustrated? Is he about to lose his mind and fire everyone in sight, and quite a few who aren't? Is he plotting the complete overthrow of the front office and coaching staff or does he have a more surgical renovation in mind? I'd like to tell you that Kroenke unburdened his mind like he was on a therapist's couch. But that's not Kroenke's style. "As you know we don't discuss or make these kinds of decisions during the season," is all he was willing to say at this point. But understand this. The man is not taking all this losing lightly. You could see it in his expressions as he moved around the locker room. People who know him well say he is extremely frustrated by what has transpired in his second season as majority owner and at the proper time — which is not in the middle of the season — he will decide what needs to be done. They say he is paying very close attention but feels no overwhelming need to prove that he is some boisterous ownership tough guy who needs to stand in front of microphones and TV cameras calling subordinates on the carpet. Just because he's not going all George Steinbrenner on us doesn't mean he's playing the role of indifferent absentee owner. In his typical "Silent Stanley" style, he prefers the low-key approach. The people who know him best say he has been gathering every snippet of information for the past two seasons — probably longer than that, really, since he's been around this franchise since 1995 — and when the season is over, he will be able to intelligently evaluate who, what, when, where and how things didn't work. Of equal importance, his fact finding must also sort out who and what is working. I've told you this before and I will continue to maintain this: Kroenke will not automatically utilize the scorched earth approach when all is said and done. People who he believes are part of the solution could survive regardless of popular opinion, and those who he believes are part of the problem will be gone. There will be evaluations about the current operating structure of the football organization. There will be appraisals about how decisions are made, who makes them, when they make them, and if they should be making them. There will be accountability in every aspect of the operation of this organization, and in the end, changes will be made. But do not be surprised or disappointed if he does not follow the whims of popular opinion. Quite frankly, draw comfort from that. There have been plenty of times during the course of his struggling run as the Rams' coach that when the smoke cleared on another Sunday afternoon debacle you could always find some thin wisp of promise in Steve Spagnuolo's reclamation project. Sometimes — heck, most of the time — it took a lot of squinting to see the good amidst the disaster of a 10-33 record. 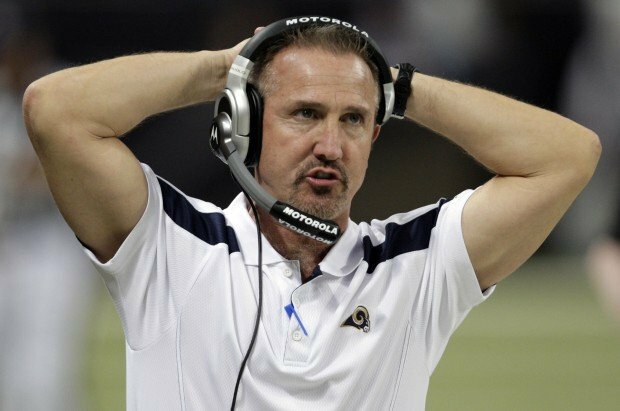 But there always has been something this man's focused, relentlessly optimistic, tunnel-vision public approach and his unwavering "My way or the highway" control-freak personality behind the scenes that convinced me Spagnuolo eventually would find a way to fix this mess of a franchise and turn the Rams into championship contenders. That faith was shaken hard Sunday. The results we've been waiting to see — the big turnaround after last year's surprising leap from a 1-15 disaster in 2009 to a 7-9 season that had everyone believing the Rams were on the verge of winning the NFC West title — just have not happened. The Rams are getting worse, not better. With a 23-20 loss to Arizona on Sunday, the Rams are now 2-9 and guaranteed of an eighth consecutive non-winning season. In the midst of all this losing, here's what continues to be so fascinating about Spagnuolo. He does not show any of the normal signs of an embattled head coach. Watch him during and after games. He does not show any of the disturbing body language of a coach on the hot seat. There are no slumped shoulders, no hang-dog expressions, no back-against-the-wall emotional flailing. Spagnuolo did not sound like a coach on the endangered list full of regret and half-baked alibis. Even while the rest of us are screaming at the results of some of his coaching decisions, Spagnuolo conducts himself with the confident air of a man who firmly believes he still is in complete control of his environment. "I think our team is passionate," he said. "I mean the work I see when they go out, I don't think there's a lack of effort. We know we're a little short-handed in some spots. ... But my pride and competitiveness says that no matter what, we've got to find a way to win." But the cold-blooded business of coaching does not reward coaches for their outstanding personality traits or hand out A's for effort. The halls of Canton are full of jerks, reprobates and brow-beating maniacs who have stalked NFL sidelines. This is a bottom-line business and winning is all that matters. What does it mean that his players don't quit? What does it mean that they fight to the bitter end every Sunday? What does it mean that his team is full of real professionals who refuse to use injuries as excuses? It doesn't buy him much more than the opportunity to let the season play out, giving him the full 16 games to determine his fate. But on Sunday, Spagnuolo committed the sort of glaring coaching errors that under the best of circumstances get owners looking at you sideways, and in the worst of circumstances — such as a loss that sends your team falling deeper into the abyss of another lost season — gets a giant target plastered on your chest. Add this to the growing list of games we've seen far too many times this season. This was a game against a bad foe that didn't deserve to win. But it was yet another game the Rams gave away, and they gave it away because of failed decisions by the coach. In the third quarter, trailing 13-10, they had a fourth-and-1 play on their own 30-yard line and the entire crowd rumbling in anticipation that Spagnuolo would go for the first down. It was one of those moments in which a struggling team already eliminated from playoff contention — with six games left — had nothing to lose. When Spagnuolo asked for a measurement, it showed the Rams were only half the length of a football away from a first down. But Spagnuolo ordered a punt. "It was just way too early in the third quarter," Spagnuolo said. "We're on our own 30. I just felt it was too risky in my opinion." What exactly would 'Spags' have risked by going for it? The expiration date on the season already is long gone. The only thing the Rams are jockeying for is favorable position in the first round of next spring's NFL draft. So where was the risk? Even if they failed to get the first down, you don't second guess the decision to go for it because it was the bold thing to do and the right thing to do. What happened next was an "out of the frying pan and into the fire" moment for Spagnuolo. He ordered the punt, but instead of Donnie Jones using the directional punt to the sidelines, he hit one right down the middle of the field to Cardinals return man Patrick Peterson, the rookie from LSU who already had three touchdowns of 80 yards or more on punt returns (including the game-winning 99-yarder the last time these teams met). "The intent was not to go down the middle," said Spagnuolo. The intent did not match the result. All together now: Arrrrrrrrrrgggggggh! One juke here, one wiggle there and whooooosh. .... Peterson hit top speed and dashed 80 yards untouched for a touchdown that gave the Cards a 20-10 lead. This might have been the most disastrous sequence of coaching decisions I've seen Spagnuolo make in his three seasons as the Rams' coach. But we only had to wait about 20 more minutes before he made another decision that would produce another agonizing collective groan. With 3 minutes, 22 seconds left in the fourth quarter and the Rams now trailing by three points, Spagnuolo was faced with another fourth-and-1 situation. The ball was on the St. Louis 36 and this time he didn't hesitate. He called for another punt, and that was the ballgame. "I thought it was (fourth and 2)," Spagnuolo said. "I thought it was 2 yards (not 1). We had three timeouts (and) I thought if we could hold them, didn't let them get the first down, we're going to get the ball right back." He must have been the only one who thought that because his defense had been shredded by the Cardinals on the ground all game long, giving up a staggering 268 yards rushing, including 228 by Beanie Wells. The Cardinals were averaging more than 7 yards a carry, and there was absolutely a zero shot that the Rams would get the ball back again. And the Rams never got the ball back. They used all three timeouts and the Cardinals ran out the clock. There's another clock that is still ticking, and it's the one that measures the time remaining on Spagnuolo's head-coaching life. I still think there's a chance to keep it running, but it's dwindling. Can he control that clock and make this thing work? We have five weeks to see if he can. The Rams' primary objective for the rest of the season should be perfectly clear: adjust the offense and do everything possible to protect and preserve QB Sam Bradford. He's been sacked 37 times this season, more than any NFL QB. (And that's with missing two games because of an ankle injury.) Bradford is near the top of the board for most hits and most hurries. One injury has already taken him out of the lineup. What's the point of allowing Bradford to absorb a needless beating? What is being gained by having Bradford withstand so much physical punishment? Having Bradford rocked and slammed to the ground would be OK if the Rams actually had something to show for his bruises. Kurt Warner took more hits than any QB during the "Greatest Show" glory days, but the trade-off resulted in one of the greatest performances in NFL history. The Rams threw 116 TD passes and and averaged 32.6 points per game over a three-season period (1999-2001.) All of those hits eventually impacted Warner's health and career, but Kurt and the Rams were willing to pay that price. Bradford is a tough QB; he doesn't complain about getting smacked around. Bradford -- like Warner and any competitive quarterback -- is willing to stand in, suffer the pain of a nasty hit and make the throw. They will sacrifice if it means making a play. But Sam and the Rams are getting nothing in return for this steady QB abuse. They're last in the NFL in points per game (12), they're last in touchdowns from scrimmage (10), they have the league's worst third-down conversion rate (29.9 pct.) they rank 30th of 32 teams in yards per passing attempt (5.81), they are 27th in average yards at the point of the catch (5.5) and are tied with Jacksonville for the fewest number of TD passes (6). The Rams aren't making big plays, they aren't scoring, they aren't winning. So again, please tell me: what is possibly being achieved by exposing Bradford and increasing the likelihood of injury or advanced erosion in his play? We've already watched Bradford descend into regression, and in my opinion there's no question that a lot of this is related to the cumulative effects of the punishment he's taking in this offense. Last season, in the more conservative and cautious West Coast offense coordinated by Pat Shurmur, the Rams did a very good job of protecting Bradford. He played every snap of the 16-game season. He was sacked only 34 times. Only 11 NFL teams had a better rate of sacks per play (5.4 pct.) than the Rams. Shurmur's approach gave Bradford a lot of quick, three-step dropbacks and short throws. The system kept Bradford secure, enhanced his confidence and gave him a chance to take root in the NFL. Oh, and by the way: the offense that caused so many fans to go wacko in ripping Shurmur also averaged 18.1 points per game. It was more productive than the sputtering Josh McDaniels offense we're seeing now. Shurmur-ball was hardly an air show, and it tended to be bland. But the small-ball Shurmur offense manufactured a lot of long drives, kept the chains moving, and kept the Rams defense fresh. The small-ball offense greatly reduced the number of hits on the QB and gave Bradford a chance to make plays. Last November 11, I wrote a column about the benefits of the Shurmur offense and was ridiculed for it, but I doubt that anyone of sound mind would dispute my premise these days. The Josh McDaniels offense may not be as boring in terms of philosophy, but it isn't working. Bradford isn't being protected. Bradford isn't getting better. And the Rams aren't rolling up points. The McDaniels offense is averaging six points less a game than the Shurmur offense. With the Shurmur style the Rams ranked 14th in time of possession last season; this season they rank 26th. No, the Rams can't reinstall the West Coast Offense. But they can modify what they have. With the injuries wrecking the team's supply of offensive tackles, it's imperative to take extra measures to limit the damage on Bradford. No more of this empty-backfield nonsense. If a young and inexperienced kid (Kevin Hughes) has to play left offensive tackle, you'd better line up a tight end next to him to help keep the wolves away from Bradford's throat. The Rams have to grind it out on the ground as much as possible with Steven Jackson. McDaniels has to simplify the offense and scale it down -- the way the Rams did for backup A.J. Feeley -- and give Bradford more three-step drops and quick throws. If it's boring, who cares? And it's getting the quarterback killed, for no good reason. "I'm worried about Sam," Steven Jackson told 101 ESPN on Monday. If McDaniels won't alter the offense, it's up to head coach Steve Spagnuolo to intervene. That's what good leaders do. It was strange and ugly, befitting the status of two teams with a combined record for 4-12 entering the game. But the Rams were beneficiaries of rare good fortune, with a potential game-winning field goal by Cleveland going awry on a fouled up long snap with 2 minutes 13 to play. The Rams were able to run out the clock and survive for a 13-12 victory over Cleveland. The Rams improved to 2-7 overall with Cleveland falling to 3-6. The Rams got their first touchdown since the New Orleans game two weeks ago _ and scored in the red zone, no less _ but they missed out on a couple of other opportunities and led by only 10-9 at the half. Coach Steve Spagnuolo opted against a 52-yard field goal attempt on the Rams' first possession, even though it looked like Josh Brown would've made the kick with the wind at his back. When punter Donnie Jones' subsequent punt rolled into the end zone, the Rams had gained only 14 yards of field position on the change of possession with the Browns taking over on their 20. With 10 of 11 plays gaining eight yards or less, the Browns got on the scoreboard first, on Phil Dawson's 44-yard field goal with 4:56 to go in the first quarter. This 3-0 lead was practically cause for parade in Cleveland, because the Browns had been outscored 58-6 in their first eight games. The lead didn't last long. The Rams carved out a long drive of their own, and this one ended up in the end zone on a 7-yard pass from San Bradford to Brandon Lloyd. Lloyd beat Cleveland's best cornerback, Joe Haden, on the play by faking an inside post route and then breaking outside and into the clear. But the Rams managed only one more score in the first half, and that came on a 29-yard Brown field goal after a drive stalled in _ surprise _ the red zone with 1:07 left in the half. Earlier in the second quarter, St. Louis also committed a turnover near midfield when a Bradford pass was tipped and intercepted by Browns linebacker Scott Fujita. Meanwhile, Dawson kept kicking field goals for the Browns. Field goal No. 2 came midway through the second quarter after a trick play. Wide receiver Joshua Cribbs lined up at quarterback in the wildcat formation, and then tossed a handoff to quarterback Colt McCoy, who then threw a 21-yard pass to backup quarterback Seneca Wallace. After the halftime break, Dawson tacked on two more field goals to give Cleveland a 12-10 lead The Rams were moving the ball well after taking the second-half kickoff, but then came a rare fumble by Steven Jackson, fighting to reach the first-down marking after taking a short pass from Bradford. Browns linebacker Chris Gocong forced and recovered the fumble, Jackson's first lost fumble of the season and just the 15th in more than 2,300 career touches. The Browns didn't score off that turnover, but it helped them out field position-wise, and Dawson's fourth field goal of the day gave Cleveland a 12-10 lead with 33 seconds left in the third quarter. With injured players dropping left and right for the Rams, Jackson remained a constant. Jackson topped 100 yards rushing for the third game in a row early in the fourth quarter. But even thought Cleveland entered the game ranked 30th in run defense, most of the yards didn't come easy for Jackson. A special teams takeaway helped the Rams regain the lead. Linebacker David Nixon, signed four days ago by the Rams to help on special teams because of injuries to Josh Hull and Bryan Kehl, did just that. He stripped punt returner Cribbs of the football, with linebacker Ben Leber recovering the fumble at the Cleveland 5. Two runs by Jackson gained 11 yards and put the Rams in field goal range. But a third-and-3 pass attempt at the Cleveland 9 resulted in a sack of Bradford. So the Rams settled for a Brown field goal and a tenuous 13-12 lead with 7:42 to play. Just how tenuous that lead was became apparent on the next play, when Brown's kickoff rolled out of bounds inside the 5-yard line. That's a penalty, with the ball spotted automatically on the Cleveland 40. Three plays later, the Browns had a first down at the Rams' 19, and time dwindling. On fourth down from the 4, facing little more than an extra point, the Browns lined up for a potential game-winning field goal. Dawson is one of the game's most reliable kickers. But in one of the strangest field goal attempts you'll ever see, long snapper Brian Pontbriand's snap accidentally caroomed off guard Alex Mack's leg. The snap skipped back to holder Brad Maynard, but Dawson's timing was thrown off. The kick was low and to the left and the Rams hung on for the victory. Orleans. So much for any November momentum. season to defeat the Rams 19-13 in overtime. third season as Rams head coach, and the clock is ticking. advance the ball into Arizona territory at the 41. Skelton, who started in place of the injured Kevin Kolb at quarterback. tried to throw the ball away. and a safety to beat for the score. 22-yard completion over the middle to Brandon Gibson. three-yard loss on third-and-4 from the Arizona 27.
field goal and a 6-3 lead. cornerback Richard Marshall resulted in another sack. ST. LOUIS—Maybe the good karma from the World Series transferred over to the St. Louis Rams on Sunday afternoon. The winless Rams shut out the powerful New Orleans offense until midway through the fourth quarter and rode the stellar defensive effort to a 31-21 victory over the Saints. The Rams returned one of their two interceptions for a touchdown, blocked a punt and continually harassed quarterback Drew Brees(notes) while smothering the Saints offense. Safety Darian Stewart(notes) returned an interception 27 yards for a touchdown with 2:51 remaining to seal the Rams' first win of the season. "I just read the play and broke on it. We had to come up with a big play, and I came up big," Stewart said. First-round draft pick Robert Quinn(notes) had his best game as a Ram with a blocked punt and a crucial first-half sack to stall a Saints drive.Chris Long(notes) also stood tall with three sacks on a flustered Brees. Quinn blocked a Thomas Morstead(notes) punt with 1:41 left in the first half to set up the Rams at the New Orleans 15-yard line. Quarterback A.J. Feeley(notes) connected with Greg Salas(notes) for a 12-yard gain to the 3-yard line. Salas fumbled, but an alert Steven Jackson fell on the ball. Jackson scored from 3 yards out on the next play to give the Rams a 10-0 lead. Jackson finished with 159 yards on 25 carries and added four receptions for 32 yards. He also inspired the team with an emotional pregame speech. "I told the team that if you have ever been in a fight, if you have ever been punched, you can either run or find the will to keep fighting," Jackson said. "I challenged them as football players. I challenged them as men to find something inside them they didn't know they had. I think you saw that in the fourth quarter." Brees was intercepted by Josh Gordy(notes) on the first play from scrimmage following the kickoff. Feeley capped a seven-play, 38-yard drive with an 8-yard touchdown toss to Brandon Lloyd(notes) to make it 17-0 at halftime. Feeley said Lloyd "called his own play" and told the quarterback, "I'm running this." Feeley had 20 completions on 37 attempts for 175 yards and was not intercepted. Lloyd caught six passes for 53 yards and the TD. The Rams took a 3-0 lead with 8:32 left in the second quarter on a Josh Brown(notes) 38-yard field goal. After holding the Saints and forcing on punt on New Orleans' first drive of the second half, the Rams immediately went back to work on offense. An 11-play, 73-yard drive ended with Jackson's second touchdown of the day on a 3-yard run. The key play of the drive was Jackson's 32-yard run on fourth-and-2 from the Saints' 35-yard line. Down 24-0, the Saints scored their first points with 1:21 left in the third quarter when Feeley was sacked and fumbled on his own goal line. The ball was recovered by linebacker Jonathan Vilma(notes) for a touchdown. A three-yard Pierre Thomas(notes) touchdown run cut the Rams lead to 24-14 with 10 minutes left in the game. Stewart's interception return pushed the Rams' lead back to 31-14. Brees hit Lance Moore(notes) for an 8-yard touchdown with six seconds left in the game to cut into the final margin. NOTES: Chris Carpenter of the St. Louis Cardinals tossed the coin before the game, and the Rams won the toss. The baseball team was on hand and was recognized during the first quarter. … Jackson's two touchdowns moved him to fourth on the Rams' all-time TD list. … The Rams were clad in their 1999 Super Bowl champion throwback jerseys. … Saints first-round draft pick Mark Ingram(notes) was on the inactive list with an injured heel suffered in the 62-7 blowout of Indianapolis last week. … The Saints activated running back Chris Ivory off the physically unable to perform list and released tight end Tory Humphrey. ARLINGTON, TEXAS -- A former University of Oklahoma star flashed his considerable talents Sunday at Cowboys Stadium, and it wasn't Sam Bradford. Bradford, the former Sooners Heisman Trophy winner, could only look on in admiration -- or was it disgust? -- as former OU teammate DeMarco Murray left his cleat marks all over the St. Louis defense. Murray got his day started with a 91-yard touchdown run in the first quarter, and didn't stop until he had gone well over 200 yards rushing. His 252 yards rushing was a Cowboys single-game record and also a record for a Rams opponent. On this day, the Cowboys didn't really need Tony Romo except to hand off. But Romo got into the act as well, throwing a couple of TD passes as the Dallas crushed the hapless Rams 34-7. The Cowboys improved to 3-3; the Rams fell to 0-6. Veteran A.J. Feeley made his first start since 2007, in place of Bradford who did not suit up because of a high ankle sprain. The Rams couldn't sustain much of anything on offense, even with the addition of Brandon Lloyd to the receiving corps via last Monday's trade with Denver. As for the St. Louis run defense, it made Murray look like the next Emmitt Smith or Tony Dorsett with a mirage of missed tackles and missed gaps. For the second week in a row, the Rams had their opponent backed up near the shadow of its goal line. And for the second week in a row, they gave up a touchdown of 90 yards-plus. Last week in Green Bay, it was Jordy Nelson racing 93 yards with an Aaron Rodgers pass. Sunday against Dallas, it was Murray racing 91 yards on a run up the middle for the game's first touchdown. It was the longest run against the Rams in franchise history and came on a delayed handoff that had the St. Louis defense thinking pass. Defensive tackle Fred Robbins looped to the outside on the play and linebacker Brady Poppinga was blocked at the point of attack, leaving a gaping hole. Late in first quarter, Cadillac Williams fumbled away a screen pass with the Cowboys taking over at their 38. Despite a sack by James Hall, the Cowboys gobbled up yardage in big chunks in the passing game after the takeaway, with Tony Romo completions of 18 yards to Jason Witten, 34 yards to Dez Bryant, and 17 yards to ex-Ram Laurent Robinson giving them a first-and-goal at the St. Louis 4. On third-and-goal from the 1, Romo threw to a wide-open Jason Witten for a TD and a 14-0 lead. In what looked like a busted coverage by the Rams, safety Quintin Mikell was left trying to cover two Cowboys in the end zone. Once he left Witten, that's where Romo threw it. But the Rams' offense showed some rare life following the ensuing kickoff, taking over on its 15. The big play came on third-and-3 from the Dallas 46, with Steven Jackson roaring up the middle for a 40-yard gain to the Dallas 6. Operating against the NFL's top-ranked rush defense, Jackson had only 14 yards on 10 carries until that run. On the next play from scrimmage, Jackson scored on a 6-yard run, running untouched to his right into the end zone. The Rams got the ball back with a chance to tie before halftime, but a third-down throw by Feeley intended for Brandon Lloyd was intercepted by Dallas corner Mike Jenkins, giving the Cowboys possession on the St. Louis 30 with 3:34 to play in the first half. But Dallas, second-worst in the league in red zone offense ahead of only the Rams, had to settle for a 30-yard field goal by Dan Bailey and a 17-7 halftime lead. The Rams matched Green Bay yard-for-yard, first down-for-first down. Unfortunately for them, they didn't come close to matching Green Bay point for point, falling to 0-5 on the season Sunday. With the Rams squandering scoring chance after scoring chance, Green Bay jumped to a 24-0 first-half lead and cruised to a 24-3 victory Sunday, staying unbeaten for the season at 6-0. The Rams missed a field goal on their first possession of the game, and settled for a field goal on their last possession of the half after reaching the red zone. In the second half, each of the Rams' first five offensive possessions reached Green Bay territory, including advances to the Packers' 10_ and 15-yard lines. But how many points did the Rams get out of all that? Zero. The best chance came late in the first quarter. On a first and goal from the 10, quarterback Sam Bradford badly underthrew a fade pattern in the end zone intended for Danario Alexander, with Sam Shields intercepting the pass. Later in the second half, a potential scoring drive was scuttled by a 16-yard loss when a backwards pass eluded Cadillac Willams. And midway threw the fourth quarter, a fourth-and-6 pass to tight end Lance Kendricks right at the first-down marker was dropped. It was that kind of game and it's been that kind of season for the Rams. Missed opportunities and sloppy play have been consistent themes. It's not as if the Packers had receivers running free all day against the Rams _ just enough to take a 24-3 halftime lead thanks to three Aaron Rodgers touchdown passes plus a Mason Crosby field goal. The Packers led by only 3-0 early in the second quarter, when Rodgers got his throwing arm warmed up on a chilly, windy day at Lambeau Field. After a fourth-and-3 gamble by the Rams failed at the Green Bay 41 late in the first quarter, the Packers had the short field to work with. A fourth-and-1 gamble by the Packers at midfield resulted in a 15-yard gain by James Starks. Rams linebacker Brady Poppinga, the ex-Packer, slipped at the line of scrimmage, giving Starks an extra-large running lane. On the next play, Rodgers completed a 35-yard TD pass to James Jones, with defender Justin King trailing by a couple yards on the play. It marked the fifth TD pass King has allowed in the last three games for St. Louis. Green Bay scored on TD passes on their next two possessions. After Quinn Porter downed a Donnie Jones punt on the Green Bay 7, the Packers struck for seven on the next play. On the play, Al Harris bit on a play fake by Rodgers, leaving Jordy Nelson uncovered. Both Harris and safety Darian Stewart had chances to tackle Nelson at the Rams 40, but both missed, tripping over each other in the process. The 93-yard touchdown was a career long throw for Rodgers and a career-long catch by Nelson, giving Green Bay a 17-0 lead with 9 minutes 11 seconds left in the first half. Before the half was out, Green Bay got back in the end zone on a seven-yard pass from Rodgers to Donald Driver. Driver was double-teamed by King and Craig Dahl at the goal line, and well covered at that. But King and Dahl both left Driver _ heading for the line of scrimmage thinking Rodgers might scramble. Rodgers didn't scramble _ he tossed the ball to a wide-open Driver with 1:51 to play, stretching Green Bay's lead to 24-3. Going with a no-huddle offense almost exclusively, the Rams gained 222 yards in the first half, good output against any defense. But they had only three points to show for it. Jason Brown missed a 47-yard field goal attempt, wide right, on the Rams' first possession of the game. Brown made a 36-yard field goal with 3 seconds left in the second quarter. Mike Sims-Walker, who was signed in free agency almost immediately after the lockout to give the Rams help at wide receiver, was among the pregame inactives for St. Louis on Sunday. Sims-Walker, who had a couple of drops against Washington prior to the bye week, was working with the "scout" team by the end of the practice week, running the routes of Green Bay receivers for the Rams' starting defense. The Rams are expected to start Brandon Gibson and Danario Alexander at wide receiver against Green Bay. There were other lineup/inactive developments as well. Veteran Ben Leber, who started the first four games at weakside linebacker, was inactive. The former Minnesota Viking had done little so far this season, and is expected to be replaced in the starting lineup by Chris Chamberlain. Veteran Rod Hood also was inactive, meaning street free agent Brian Jackson _ added at the start of the practice week _ will join Justin King, Al Harris, and Josh Gordy as the four active cornerbacks against Green Bay's potent passing game. King and Harris will start, with Gordy the third corner in the Rams' nickel and dime packages. For the second game in a row, running back Jerious Norwood is on the inactive list. As a result, RB Quinn Porter is likely to return kickoffs, with potential help from Austin Pettis. With newly-signed WR/return man Nick Miller on the pregame inactive list, Pettis, Porter and Greg Salas are all options on punt returns. The Rams' other inactives Sunday were TE Stephen Spach and DE C.J. Ah You. The roster decisions mean that rookie wideouts Pettis and Salas are both active for the first time this season. In addition, rookie linebacker Jabara Williams makes his NFL debut for St. Louis. For a few fleeting minutes, there was a flicker of hope. After all but sleepwalking for three quarters the Rams managed a field goal and a touchdown in the fourth quarter, chipping into what had been a 17-0 Washington lead. Then linebacker James Laurinaitis picked off an underthrown Rex Grossman pass and returned it 15 yards to the Washington 19. With 5½ minutes left to play, the Rams were in the red zone with a chance to tie the score. "There's no doubt when we got that interception, I thought we were going to score," quarterback Sam Bradford said. "We were going to tie the game. Then I thought our defense was going to get another stop; I thought we were going to get it back and go win the game in (a) two-minute drive." So much for the optimism of youth. In the end, the Rams reverted to form. And in 2011, "form" on offense translates to dropped passes, missed passes, shoddy pass protection and penalties. And so it was Sunday at the Edward Jones Dome. An incomplete pass on first down was followed by an illegal shift penalty, and then back-to-back sacks allowed by left tackle Rodger Saffold. Just like that, first-and-10 from the 19 became fourth-and-30 from the 39. The Rams couldn't even get a field goal out of the Laurinaitis takeaway. They were forced to punt and ultimately punted away a chance at the ever-elusive first victory of 2011. The Rams never got close to scoring range again and fell to 0-4 for the season with a 17-10 loss. Thanks to a bye week, the Rams now have two weeks to contemplate their plight. When they return to action Oct. 16, it will be in Green Bay, home of the Super Bowl champion Packers. Next comes a trip to Dallas on Oct. 23, followed by a visit from the 2009 Super Bowl champ — New Orleans. The season is slipping away faster than you can say "miscue." There's no getting around it: If the losses continue to mount, the job security of coach Steve Spagnuolo and general manager Billy Devaney will be in doubt. "Every Sunday's a sense of urgency," Spagnuolo said afterward. "If we were 4-0, and we were getting ready to play the fifth game, it would be pretty urgent because you can go the other way pretty quick. So I don't think it changes." But something must change, because the Rams continue to make the same mistakes over and over. A week after being sacked a career-high five times, Bradford was sacked seven times Sunday for a new career high. Those aren't the kind of "milestones" the Rams had in mind when they drafted him No. 1 overall in 2010. Without throwing anyone in particular under the bus, Bradford clearly is getting frustrated with his pass protection, or lack thereof. "We've got to figure it out," he said. "You can say run 'three-step,' you can say run 'quick game,' get the ball out of your hand quicker. At some point you've got to be able to throw the ball down the field. And in order to do that, you've got to have time to read out the routes because they take time to develop. So hopefully during this bye week — we've got two weeks to get it figured out before we play next. But that's one area where we definitely need to be better." "I'm not going to lie," Bradford said. "It is getting frustrating, just for the fact that when we put ourselves in situations early in the game where we get behind, we've got to throw the ball to get ourselves back in the game and we've got to pick up chunks of yards. In order to do that, in order to put points on the board, you've got to have time to go through the progressions and read it. I'm not saying there weren't times today where I could've gotten the ball out quicker. I'm definitely going to have to look at the film and see that, too. But we've got to be better." Saffold, who played so well as a rookie last year but has struggled much of this season, had a particularly tough day against Washington. He was clearly agitated in the locker room afterward. How can the Rams do a better job of protecting Bradford? "We've just got to go back out there and take care of it," Saffold said. "Simple as that. It'll come. We've just got to go back to the drawing board and fix the mistakes. That's all it is. That's all you can do every single week. It's not going to change. My answer's not going to change." All told, the Rams managed a meager 172 yards of offense Sunday, the ninth-lowest output for the team since the move to St. Louis in 1995. Not even the return of running back Steven Jackson to full status for the first time since his thigh injury in Week 1 helped. He gained 45 yards on 17 carries, averaging just 2.6 yards a rush, and caught four passes for 19 yards. The Rams dropped at least six passes, including two by Mike Sims-Walker and two by Lance Kendricks. "No excuse," Sims-Walker said. "I gotta catch the ball. That's what I'm here for. I gotta make plays, and I didn't make 'em today." And there's more. The Rams were flagged for five false starts, four against the offense and one on special teams. False starts usually are much more common on the road because of crowd noise, but not for the Rams. "Most of those (Sunday) came on hard counts," Bradford said. "We've just got to do a better job of hanging in there." And not just at the line of scrimmage.